Further confirmation that the Kasperite proposal has struck powerful opposition. 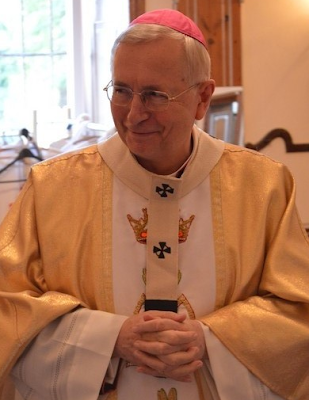 From Archbishop Stanisław Gądecki's blog. (translation by Toronto Catholic Witness. You may use freely, but must credit us). This morning was the last phase of the work of the thirteen Synodal small groups - circuli minores. Each of these language groups prepared their own separate text. In the Italian Group A, which involves the work of the Metropolitan Archbishop of Poznań [Gądecki], were discussed the points that were still questionable and the entire text was given to a vote, which in the afternoon will be presented to the plenary General Congregation of the Synodal assembly. In the final relatio from our circuli there is not one word about Holy Communion for the divorced and remarried. I conclude from this that the editors had to have made a strong about face, since earlier they strongly defended that position, and now have so quickly resigned from it. I don't think that any of the pastors of the Church would wish to make the situation difficult for those who are divorced and in new unions, and to trample on them or stigmatize them. The idea is to include them as much as possible in the life of the Church according to the principles that St. Pope John Paul II wrote in his Apostolic Exhortation, "Familiaris Consortio". Tomorrow, the Commission will meet to develop a final relatio, which will be presented to the Synodal Fathers for further discussion. I only wish to say, many thanks to the Toronto Catholic Witness for keeping the faithful informed on what is happening in the Synod. We are praying for the Bishops and for the Truth of our Faith. Many thanks to Toronto Catholic Witness for informing the faithful of happenings in the Synod. We pray for the Bishops and for Christ;s Church. Keep praying. May the Holy Spirit squelch the heretics.